Do you often find yourself changing the columns you're viewing in Bing Ads? Are you tired of repeating the process each time? Have you found that a second here and a second there adds up pretty quickly? We’ve fixed that. Now, you can pick the columns you want, arrange them in the order you prefer and save it for the next time. Furthermore, the columns are saved per user, per account, so each user on an account can create the columns views that they want to use. 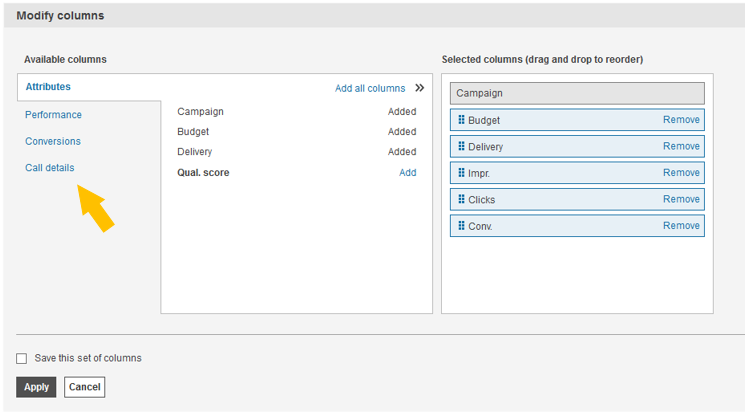 You can also now find the columns that you want to add to your campaign table by using the categories in the column chooser. The columns will be grouped under various categories such as Attributes, Performance, Conversions and Call details so you can easily find the column you’re looking for without having to scroll through one long list. 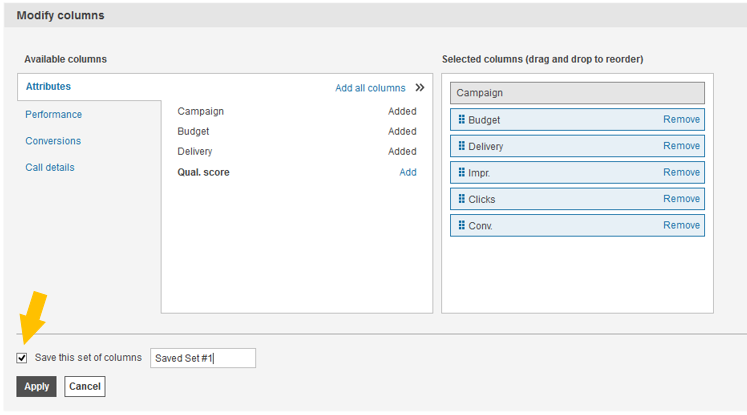 To apply and save columns to your table, first click on the Columns control in the Campaigns, Ad groups, Ads, Keywords, or Product Targets tabs and then select Modify columns. You can then add or remove the columns that you want to see in the table. You can find the various columns you need by switching between the column chooser categories on the left. You can then click on the Save this set of columns check box and enter the custom name for the columns you want to save. Click the Apply button and your columns will be applied to the table you're working in. In the Columns menu, you can now see your new saved column set and know that it is applied to the table by the check mark next to the name. Next time you come back to Bing Ads, just click on the Columns menu and select the name you provided for your saved columns to apply it to the table again. If you don’t have this functionality showing up in your Bing Ads account(s) yet, don’t worry! It will be rolling out over the coming week. Let us know what you think! Questions, comments or concerns? 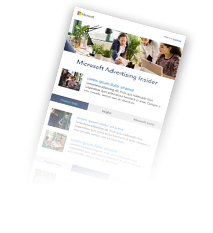 Connect with us on Twitter or share a feature idea on the Bing Ads Feature Suggestion Forum.